Atlanta’s return to the postseason following a four-year absence hit a speed bump in the person of Giants ace Tim Lincecum. San Francisco’s diminutive flame-thrower sliced and diced the Braves lineup to the tune of 14 strikeouts while tossing a two-hit complete game shut-out in Game 1 of the National League Division Series on Thursday. Pitching dominated the night. Lincecum’s mastery was met blow-for-blow by Braves starter Derek Lowe in the early going, before a blown call and a misplayed ball gave the Giants the only run they would need to grab the series opening victory. Scoreless in the bottom of the fourth, Cody Ross gave the Giants a 1-0 lead with a single that plated catcher Buster Posey. A controversial stolen base call on the back end of what appeared to be a strike-em-out, throw-em-out double play allowed the Giants to continue their quest to supply some run support for Lincecum (1-0). Posey had opened the inning with a single and was in motion when a strikeout was recorded at the expense of Pat Burrell. Second base umpire Paul Emmel called Posey safe, though replays showed Braves second baseman Brooks Conrad tagged Posey prior to his foot reaching the bag. Following a strikeout of Juan Uribe, Atlanta opted to walk Pablo Sandoval intentionally and go after the right-hand hitting Ross. That move backfired when Ross lined a run-scoring single under the outstretched glove of third baseman Omar Infante. Lowe (0-1) lasted 5 1/3 innings before being lifted in favor of lefty Jonny Venters in the sixth. The veteran right-hander surrendered a run on four hits, walked four and struck out six in taking the loss. Though Infante struck for a game-opening double, it would not prove to be a harbinger of things to come. Instead, Lincecum harnessed the adrenaline and struck out Brian McCann and Derrek Lee to close the inning and begin his night of dominance. Only a fourth inning walk to Jayson Heyward allowed the Braves to put a runner aboard between the first and seventh innings, when Brian McCann laced a one-out double in the seventh inning. Those 14 strikeouts for Lincecum established a new single-game postseason record for a Giants pitcher, with 12 of them of the swinging variety. Infante was the only Braves hitter who was not punched out at least once by the Giants starter, who was making his postseason debut. Lincecum’s performance was the story of the night, but five Atlanta pitchers combined to limit the San Fransisco offense to just five hits. Four Braves relievers held the Giants to just one hit over the final 2 2/3 innings. The replays and the photos are worth a thousand words, but the Braves have no choice but to put a frustrating series opening loss behind them and focus on winning Game 2. In order to do that, Atlanta will look for a strong start from right-hander Tommy Hanson (10-11, 3.33) as he locks horns with Giants righty Matt Cain (13-11, 3.14). Lincecum’s bigtime start helps to somewhat mask the fact that the Giants offense had its share of struggles in Game 1 as well. The Braves seemingly could not find the answers to Lincecum, who routinely got hitters to chase two-strike pitches well out of the zone. 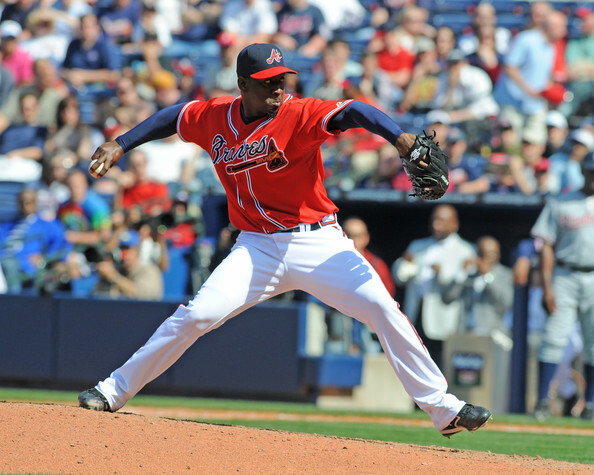 Atlanta was aggressive offensively, which they will need to continue on Friday against Cain. The difference and/or adjustments will likely come in the form of being more selective at the plate when behind in the count. The blown call on Posey’s fourth inning steal of second base only furthers the public outcry for some kind of replay to be instituted. Of course, that won’t help the Braves or any of the other teams that may have felt slighted by a call on Thursday. It is a somewhat unfortunate trend to see popping up with regularity, especially given the fact that postseason games are under a higher degree of scrutiny. The human error defense ain’t what it used to be. Hanson will make the first postseason start of his career, and he will be hoping to get more run support than he received throughout the year. Atlanta averaged just 3.0 RPG in Hanson’s final 18 starts of the regular season, and he won just three times after July 1. Cain found himself in a similar situation in the first half. Despite a solid 3.34 ERA over his first 18 starts, Cain’s record sat at 6-8 and it appeared he may be in for another season in which his record was not indicative of the way he was pitching. Cain turned it on with a 2.91 ERA and a 7-3 record over his final 15 starts, walking just just 19 men in 102 innings over that stretch. San Diego homered three times and battered Cain for six earned runs in his last start of the regular season. If Hanson can shed any ill-effects caused from fouling a ball off his eye in batting practice on Thursday and continue his excellent work from the final three starting assignments of the year (1 ER in 18.2 IP) then the Braves could have a good chance of heading back to Atlanta with the series tied at a game apiece. The Atlanta offense will have to find a way to break out and provide those runs. That was something was increasingly hard to do in September/October as the team averaged just 3.5 RPG in over 30 games to close the season. The opening day of Winter Meetings activity is winding down, with only one tangible Braves headline. After weighing his options on the free agent market, reliever Rafael Soriano has chosen to accept the club’s offer of salary arbitration. Meanwhile, Mike Gonzalez decided to decline the Braves offer and test the open market. I wouldn’t categorize Soriano’s return as “shocking,” but it does set up some interesting story lines to follow. His career year in 2009 will no doubt make the righty desirable to clubs who are searching for a closer. Keep in mind that Soriano will now have to approve any trade that occurs before June 15. It’s not to say that will keep possible suitors from pursuing Soriano, who registered a career-best 27 saves and averaged over 12 K/9 in a career-high 77 appearances. Rumors linked the Houston Astros as having interest. That would be one possible destination, based on the fact that Houston’s incumbent closer, Jose Valverde, declined their arbitration offer to become a free agent. Mark Bowman of MLB.com spoke with Braves GM Frank Wren earlier in the day, outlining that any decision to return by either Soriano or Gonzalez would not affect the plans that are in place for Billy Wagner and Takashi Saito to anchor the bullpen and serve in the late innings. Looking at the dollars involved with Soriano, most project him to command a raise that would be somewhere in the $6.5 million to $8 million range through his arbitration hearing. Gonzalez will fetch the Braves compensatory picks when and if he signs elsewhere. Bowman also points out that Wren is committed to meeting the club’s needs regardless of either Soriano’s or Gonzalez’s decision to accept arbitration. Those needs, as we well know, involve bringing in a first baseman and at least one outfielder, both of whom will be looked upon to provide power and stable run production. Whether it be via the trade or a free agent signing, Wren will continue to seek out the right pieces. Most of the trade chatter has the Braves looking to deal Derek Lowe rather than Javier Vazquez. Nothing probative has surfaced on that front as of yet. Lowe provides the most payroll flexibility in a deal, assuming the Braves don’t have have to eat a large chunk of the $45 million remaining over the next three seasons. It was not a hotbed of talks linked to the Braves and their search for bats. Passing pieces from various sources linked Atlanta’s interest in free agent outfielder Marlon Byrd and perhaps Georgia native Mike Cameron. Included in the linkage, the AJC’s Dave O’Brien took a look at the possible targets at which the Braves could be taking aim. Good work as always from our friends over at MLBTradeRumors.com. If you want to follow the blow-by-blow of all the daily craziness of the Winter Meetings, there is no better place. Perhaps tomorrow will offer a big bang on the Braves front. Follow me on Twitter @grantmcauley for sporadic updates on nothing in particular. the strength of their outstanding starting rotation. at the Atlanta pitching staff. same kind of misfortune to key arms. front-of-the-rotation starters at season’s end. The initial targets to anchor the rotation included San Diego Padres ace Jake Peavy and free-agent A.J. Burnett. Burnett signed a five-year pact with the New York Yankees. White Sox that netted veteran right-hander Javier Vazquez just prior to the winter meetings. Vazquez, 32, had long been coveted by Braves manager Bobby Cox. averaged 13 wins and 216 innings over the past nine seasons. The new year got off on a bad note when Braves icon John Smoltz left the only Major League club he had known for 21-season to sign with the Boston Red Sox. Smoltz, who was recovering from reconstructive shoulder surgery. thought would happen only in his retirement. record with a 3.22 ERA in 1642.1 innings. career, Lowe is 126-107 with a 3.75 ERA and 85 saves. The acqusition of Lowe, Vazquez and Kawakami fortifies the rotation in front of stand-out young hurler, Jair Jurrjens. ERA in 31 starts to come in third in the NL Rookie of the Year voting. to fill out that final spot. Among these pitchers will be right-handers Jorge Campillo and Charlie Morton, as well as lefty Jo-Jo Reyes. chooses to utilize Campillo out of the pen. relapse during his stint with Atlanta. could be used as trade bait to net the Braves an outfielder as well. with a 2.41 ERA and 163 strikeouts in 25 starts between two stops. shoulder after going just 2-4 with a 5.54 ERA in 13 starts. appearances, before the elbow injury. before elbow surgery ended his season in August. fill for the rest of the season. from Pittsburgh in December of 2006. The rest of the cast includes right-handers Blaine Boyer, Jeff Bennett and Manny Acosta. Each saw more than their fair share action due to the rash of injuries. both the mental and physical stamina to become a more complete pitcher. Last season, Boyer seemed to tire from his frequent appearances. all but shut down in September. bases took put him out of action. season’s final month. Buddy Carlyle could also get a look in the long relief role. among others, to earn a spot as lefty specialist or in middle relief. appearances over the past three seasons while with the White Sox. ATLANTA — The Atlanta Braves and free agent right-hander Derek Lowe have agreed to a four-year deal worth $60 million on Tuesday, according to the Atlanta Journal Constitution. includes Javier Vazquez, recently signed Kenshin Kawakami and rookie stand-out Jair Jurrjens. terms with free agents A.J. Burnett and Rafael Furcal, unable to complete a trade for Jake Peavy, and watched 21-year veteran John Smoltz depart in favor of joining the Boston Red Sox. after the righty completes a routine physical on Wednesday. 3.75 ERA and 85 saves.